Monoclonal Antibodies are a type of protein, which made in the laboratory that can bind to substances in the body, including cancer cells. 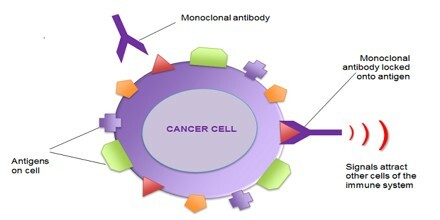 There are many kinds of monoclonal antibodies. A monoclonal antibody is made so that it binds to only one substance. Monoclonal antibodies are being used to treat some types of cancer. They can be used alone or to carry drugs, toxins, or radioactive substances directly to cancer cells. 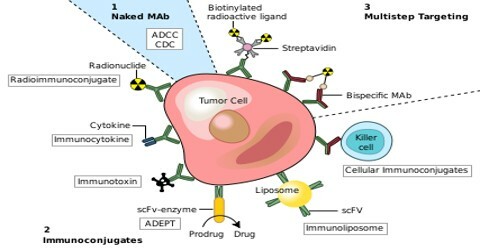 Monoclonal antibodies kill tumor cells by several mechanisms, including apoptosis and lysis mediated by complement and cytotoxic cells, They can also act as conduits for radioisotopes or toxic agents linked to them. The generic name assigned to a monoclonal antibody or fragment ends in -mab. Fusion of cell culture myeloma cells with mammalian spleen cells antibodies result in hybrid cells/hybridomas which produces large amounts of monoclonal antibody. The cell fusion resulted in two different types of cells, one with the ability to grow continually, and the other with ability to produce bulk amounts of purified antibody. Hybrid cells produce only 1 exact antibody that is more pure than polyclonal antibodies produced by conventional techniques. Monoclonal Antibodies are far more effective than conventional drugs since drugs attack the foreign substance & the body’s own cells that cause harsh side effects & the monoclonal antibody only targets the foreign antigen/target molecule, without or only minor side effects. Monoclonal antibody drugs are cancer treatments that enlist natural immune system functions to fight cancer. These drugs may be used in combination with other cancer treatments. Monoclonal antibodies are designed to function in different ways. A particular drug may actually function by more than one means. 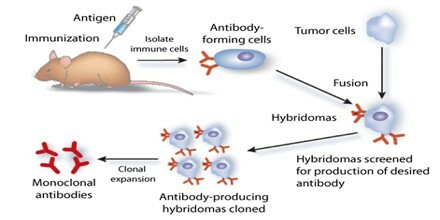 Process by which bulk quantities of targeted antibodies against a specific antigen are produced.Monoclonal antibodies are produced via multiple/identical copies of a certain cell called a hybridoma. To create Hybridoma cells the fusion of 2 cells are needed in order to combine the characteristics of the 2 cells into 1 cell. 1 of the cells is a producing cell antibody which is a B-Lymphocyte used from a laboratory mouse and the other is a tumor cell named myeloma. Tumor cells have the ability to grow indefinitely and at an exceeding rate from normal cell growth. 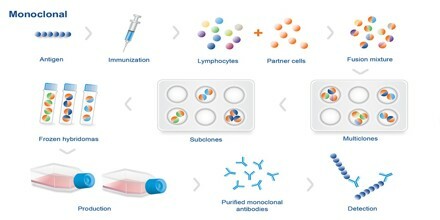 Laboratroy produced Hybridoma cells replicate much faster than normal antibody producing cells, and the individual hybridomas produce the specific antibodies for an indefinite period of time. There are 2 ways for growing monoclonal antibodies, 1 is to grow them in laboratory flasks meaning In Vitro, and the other is to grow them in the stomach lining of mice. 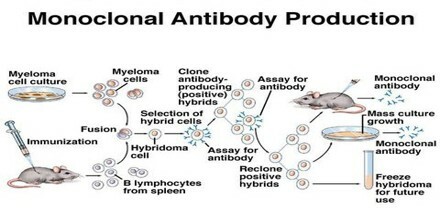 Injecting the hybridomas into the mice is the familiar method of harvesting monoclonal antibodies. This method is done by mixing spleen cells from the mouse that has been immunized with the desired antigen with myeloma cells.The myeloma cells need to have lost their ability to synthesize HGPRT enzyme (hypoxanthine-guanine-phosphoribosyltransferase) which enables the cells to synthesize purines using an extracellular source of hypoxanthine as a precursor. Cells have another pathway that they synthesize purines so lack of HGPRT is not a problem for the cell but when cells are exposed to aminopterin they are unable to use this other pathway and are fully dependent on HGPRT for their survival. So to summarize, unfused myeloma cells can’t grow since they lack HGPRT and unfused normal spleen cells can’t grow since they have a limited life-span. Hybridoma cells are grow indefinitely since the spleen-cell copartner supplies HGPRT and the myeloma partner is immortal. However, monoclonal antibody treatment for cancer may cause side effects, some of which, though rare, can be very serious.